A Renewed interest in DXing! As many of us have experienced, with fewer and fewer shortwave (SW) broadcasters available, and the explosion in RF noise polluters on the bands, it can at times become very frustrating to continue to enjoy our hobby of dxing the bands. Perhaps dxing while on vacation might just be the answer to rejuvenating one�s interest in the area. This is a report of my recent trip to Europe, including dxing in the United Kingdom, Poland and Ukraine. Recently, I had to travel to Europe to meet up with my 19 year old son who was just completing a 6-month stint on a sailing vessel. He started his voyage in January in Singapore and completed it in Gdynia, Poland almost 6 months later. He had a wonderful experience (and this can be explored further through Class Afloat website). As is usual, I like to travel with a small portable receiver and explore the bands wherever I go. Not only does this allow me to keep current with world events, it also allows me to do a little dxing away from home. It doesn�t take a lot of additional room to be able to dx with some success. In my case, I brought along a Kaito 1103 along with a set of collapsible headphones. The Kaito comes with a random wire external antenna, although in Europe, in many cases this was not needed. In addition I brought along an Edirol R-09 mp3 recorder (about the size of a pack of cards) and the latest WRTH. As you can see, there was no shortage of great stations to monitor, and this was all in one evening after dinner (conveniently located across the road at a traditional English Pub) and during the early morning before the flight. Incidently, I had no difficulties with my portable receiver anywhere during my travels, so not to worry. I always carried it in my back pack and never in my stowed luggage. 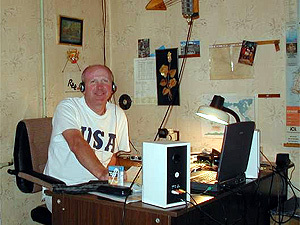 BELARUS 7105, 1950-, Radio Station Belarus Jun 28 Excellent reception in Polish, then into English at 20:00. // 7390 almost as strong, while 7440, although equally strong, but much lower in modulation and with some hum. This was my first logging from Ukraine. In this case, near Brody a small city to the east of Ukraine's western capital of Lviv. 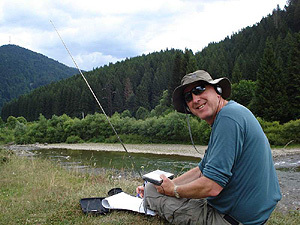 The next day, we headed into the Carpathian mountains by car. 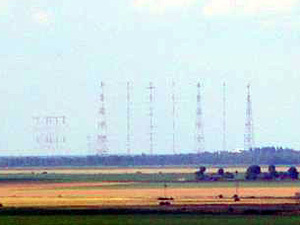 Always on the lookout for things of interest, I first noticed the Lviv/Krasne transmitter site of Radio Ukraine International. 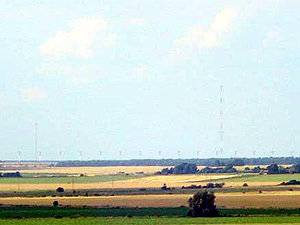 It is quite visible from the M12 highway to the south of the site. I clicked a couple of pictures from the road. Its quite a ways away. 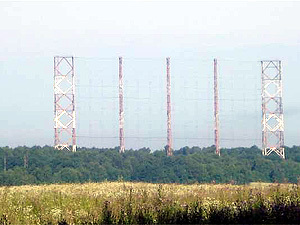 The Bolshoye Zorya antenna is visible here (the long array of shorter towers, see picture above). There were also satellite dishes to the left of the antennas in the photo. The coordinates on Google Earth (very high resolution) can be found at the following: 49deg 35 40.58N And 23deg 58 06.42E. 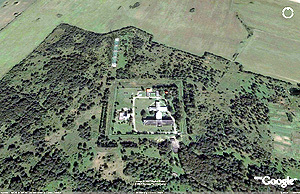 Further below you can see an image taken from space. .how private! Now, what exactly was it used for? Ideas anyone? As we entered the Carpathian mountains, I sat down for a quick scan of the bands. The joys of dxing!! After a few days in the mountains, we headed eastward towards family in the south east regions of Ukraine, but not before visiting Vlad Titarev, DXer extraordinaire, and all around wonderful guy, and very good friend. 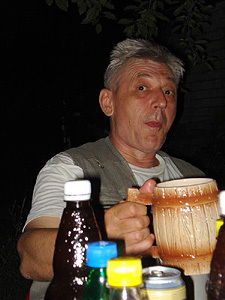 He sure facilitated things for us while in Ukraine. Thanks Vlad! While at Vlads, he allowed me the pleasure of dxing from his very well equipped dx shack. I was able to use his AOR 7030, although he also has the WinRadio 313e and some very high end Soviet era receivers. As you can see, one can have a lot of fun taking along a simple portable and some basic resources. I now have some 30 hours of audio to listen to and edit. Ill plan on posting some of the most interesting. Check DXer.ca, my local Canadian site created and managed by my good friend Colin Newell for some of those clips. I do hope that this little vignette encourages you into taking along that old portable on your next vacation! Enjoy!